Party Poker is one of the most experienced online poker rooms in the business. Party Poker has won numerous awards including the latest award, “2009 Online Poker Operator Of The Year” by eGaming. 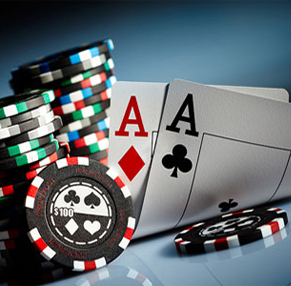 Party Poker is owned and operated by Party Gaming which not only operates PartyPoker.com, but also operates Party Bingo, Casino, and Backgammon. Party Poker has been operating since 1997 and is licensed by the government of Gibraltar. The focus at Party Gaming is on fun, ease of use, reliability and security. Their software and systems are at the forefront of technological innovation, which allows them to deliver cutting-edge game features and functionality. 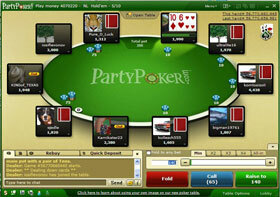 With over 13 years of online gaming experience, players can’t go wrong with Party Poker. Party Poker’s welcome bonus isn’t anything huge, but it is affective to double your starting bankroll with a 100% match poker bonus up to $100 free. Party Poker also offers a poker room school for players that are new to online poker, who can play with other new players while they learn. Party Poker offers many weekly and monthly promotions with some promotions that change and some promotions that are always ongoing at their poker room. Such promotions include “The Gladiator Challenge”, “50-Seat Frenzy”, “Bad Beat” jackpot tables, and much more. With a poker room, casino, bingo room, and also a backgammon room, along with ever-changing and ongoing promotions, players can be sure boredom is something very rarely found at Party Poker. Party Poker offers some of the best online poker tournaments in the world with such tournaments as the “Monthly Million”, “$300,000 Weekly Sunday Gtd”, as well as many satellite qualifier tournaments for winning seats into every major live tournament known to man. Recent 1st and 2nd place finishers in 2010’s Aussie Millions won their very own Aussie Millions seat while playing at Party Poker. Also offered at Party Poker are tournament promotions such as the “Sit-N-Go Step Challenge”, “$35,000 Weekday Guarantee”, along with $6 million guaranteed in tournament prize pools each month. Players will find a huge abundance of Sit-N-Go and Multi-Table tournaments that will maximize each player’s online poker experience. Party Poker offers a tournament style for every type of player! There are many seasoned players that play at Party Poker, however, there are many fish and donks as well. Players that play solid poker should be able to weed through the low class players to earn some good money while playing at Party Poker. At the low and medium stake levels, the competition is still quite soft, with quite a few loose players to be found. The high limit tables you better bring your best game, because no where we have ever played, have we ever seen high rolling players play bad. The traffic levels at Party Poker reach up to around 45,000-60,000 players on average, but during peak times, you can expect to see numbers as high as 75,000-90,000 which is impressive since the banning of USA players in the recent years. It is a pretty safe guarantee that players will never have to wait for a table to fill up at any level. The only time you may have to wait while waiting for a full table to open up. 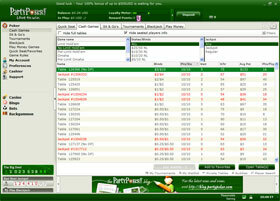 Party Poker offers lots of different poker games at every stake level along with limit, pot-limit, and no-limit stakes. Such Games include Texas Hold’em, Omaha, Omaha Hi/Lo, 7-Card Stud, and 7-Card Stud Hi/Lo. Although, there are no types of draw games, Party Poker action is found in abundance for all the games they offer. Party Poker offers almost every possible banking option you can think of. Players shouldn’t have to worry about finding an option to suit their banking needs while depositing or withdrawing to and from Party Poker. Deposit Options: VISA, MasterCard, Paysafe card, eps (Australia), WebMoney, Bancontact Mister Cash, iDeal, Laser card, Click & Buy, Click2Pay, Giro pay, ukash, Przleway24, DirectPay24, my citadel wallet, Poli, eWire, ELV Germany/Austria), Electronic Transfer (Canada), UsemyBank (Canada/U.K. ), Switch/Solo/Maestro, Moneybookers, EntroPay, Neteller, bank wire transfer, bank transfer. Withdrawal Options: VISA, Mastercard, WebMoney, Switch/Solo/Maestro, Electronic Transfer (Canada), Neteller, Click2Pay, Moneybookers, bank wire transfer, my citadel wallet, bank transfer, checks by mail, checks by courier. Party Poker utilizes all of the latest high-tech encryption methods that are comparable to most of the major online banking institutions as well as the best in fraud and collusion detection software programs available. www.PartyPoker.com has a zero tolerance cheating policy and aims to keep their poker room safe and fun for all. Party Poker’s Random Numbers Generator is one of the best we have seen for total randomness and fairness. Online support is pretty good and can be reached 24/7 by numerous telephone numbers as well as email. Online support is offered in 12 different languages to make sure that they have right people in place for all of their international countries. If you are looking for a fun and exciting online poker experience, Party Poker is a highly recommended destination for every player!